Monty holding a nice rainbow. Note the subdued green and earthy colours. Try to avoid red, yellow or white. Also, avoid stamping your feet or making sudden quick movements when stalking trout. How to avoid frightening weary trout. In New Zealand, we have a vast amount of water and luckily, in some sense, not too many anglers, although we have some areas that are over-fished. In these areas, the trout often become wise to their predator – the angler. Many of the fish that I’ve seen in these waters have learned to be cautious. You must learn stealth and avoid frightening trout. Also in this country, we have other water such as the high country streams which were seldom fished. In these areas, the water is gin-clear giving the angler an advantage. 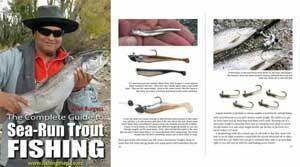 If you are fishing an area that seldom has seen anglers before one quickly realizes how easy these trout are to catch. Why in some cases they almost throw themselves at the fly or lure, seldom showing any concern for the protruding hook, think lines, etc. But alas few trout waters are like this today. The angler must use all available skills to outwit the wary trout. The only stipulation laid down by the Fish and Game Councils is that it is done with rod and line. What then must the hunter do? Firstly to avoid frightening weary trout you must learn to use and have keen eyesight, observing the fish if possible and learning the positions in which they sit, rest and feed. This important knowledge is only built up over many outings and visits to waters. The first thing you must learn is that the fish must not find you first. One of the most common mistakes which I have observed is that often the anglers wear the wrong type of clothing, hat, and glasses, thus giving the fish the opportunity to see them first. Trout have excellent colour vision and clothing of bright colours (yellows and reds) or even white or light shades that do not blend with the surroundings will give you away. Secondly, to avoid frightening weary trout the angler must select a position where he can see fish without disturbing his quarry. I have heard some top anglers say that unless you’ve worn the knees out of your gumboots or the toes out of your fishing shoes, you are not getting in the right position near the ground to reduce the chance of being seen and consequently frightening the ﬁsh. Thirdly, to avoid frightening weary trout our perfect angler will present the ﬂy in the most attractive way possible. A mistake often made by anglers is casting directly over the fish. Always false cast two or three times behind or well to the side to get the length right. Then be confident of your accuracy to place the fly at least one meter to the side and one meter in front of the fish so that the drift of the current will bring it back naturally into the trout’s vision. In still water it is important to get the tasty morsel sufficiently in front of the traveling trout, thus particular notice should be given of your position from the fish and also time allowed for the natural nymph to sink in the water column. Trout are opportunist feeders and if they refuse a fly or nymph presented under their noses they have already been frightened and in some cases, they are only frightened by the presentation of the wrong type of imitation and how it is presented. It should also be remembered that they pick up vibrations very easily through the water column by the lateral line, which runs along their side. 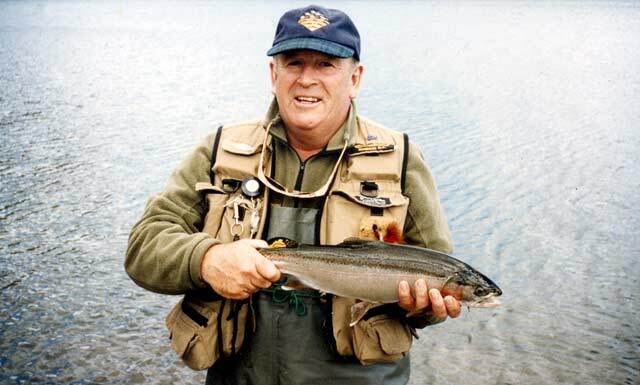 Once you have found your trout your problems should be virtually solved if you keep out of sight, keep quiet and do not make any heavy vibrations in the water. The selection of fly and nymph is also important. By observing what the main species is in the water you are fishing and then presenting your fly pattern with as much skill available. A study from Issac Walton who wrote many years ago, “Study and be quiet and stand as free from motion as possible.” If you find that the trout are near you then take care. If you have to move then do it slowly. Trout notice sharp, sudden movements but pay little heed to slow-moving forms. Along the banks of all our rivers and lakes, we have domestic animals which move slowly when they feed. This will give you extra latitude by moving at the feeding pace of these animals. If you do scare a fish it can swim upstream or out into the lake and scare more fish, spoiling your chances. Whether they can actually transmit fear underwater is a moot point but I have seen a shoal of rainbow trout in the Upper Manorburn mysteriously fade into the depths like a flock of birds frightened by a gunshot. Just as mysteriously they can resume feeding all at the same time, as though a single interpretation is understood by all. However, in spite of the fact that many anglers are aware that frightened fish don’t bite, they just refuse to believe that heavy footprints can be felt as much as 20 meters away from the bank on which the angler is walking. Of course, trout are still caught in spite of these mistakes but think how many more would be caught if care had been taken in the first place. There are casual anglers who fish for 40 years, always hoping for the big one, but they rarely get the chance because of their activities. On the other hand, there are anglers who present their ﬂy carefully, keep out of sight, even creep along the bank and they take good trout, in many cases from the same water which other anglers are fishing. Surely the extra care is well worth the effort.